Sombre ceremonies have been held in the US on the fifth anniversary of the devastating 11 September attacks which killed nearly 3,000 people. People fell silent at New York's World Trade Center site to mark the times the two planes hit and the towers fell. Over three hours, the names of the 2,749 killed there were read out. After meeting New York firefighters, President George W Bush laid a wreath at the other crash sites - in Pennsylvania and at the Pentagon. In the evening, at 2100 local time (0100 GMT), Mr Bush will make a formal TV address to the nation from the Oval Office. It will be only the fifth time that Mr Bush has made such an address to the American people - the first was on the day of the attacks. As the US began marking the anniversary, broadcasters aired an apparently new video from al-Qaeda deputy leader Ayman al-Zawahiri, who urged Muslims to increase resistance against the US. In the footage, he referred to the recent Israeli bombardment of Lebanon, saying al-Qaeda had been given "every legitimacy" to keep fighting the US and its allies. At Ground Zero, the footprint of the World Trade Center, flags flew at half-mast as the first silence was observed at 0846 New York time (1246 GMT/1346 BST) - the time a hijacked plane hit the north tower. A second silence at 0903 marked the moment that a second plane hit the south tower, and two more at 0959 and 1029 marked the times the two towers collapsed. Some relatives simply read out the names of the dead, others gave short tributes. "We love you and we miss you, every day and forever," said one woman. 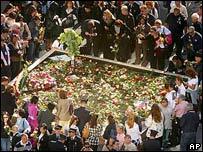 Tearful families of the victims, some clutching photos of loved ones, floated flowers in a reflecting pool in remembrance of those who had died at the site. Mr Bush, accompanied by First Lady Laura Bush, observed the memorial silences at a fire station among colleagues of the hundreds of firefighters who died during the rescue operation. He later attended a ceremony at a field in Shanksville, Pennsylvania, where United Airlines Flight 93 crashed to the ground after passengers tried to retake the aircraft. Despite cold rain, the president moved among relatives of the 40 people killed there, shaking hands and offering words of condolence. New York Mayor Michael Bloomberg and his predecessor, Rudolph Giuliani - who was in office five years ago - addressed the New York crowds. Mr Bloomberg said: "Five years have come and gone, and we still stand together as one. "We come back to this place to remember the heart-breaking anniversary and each person who died here, those known and unknown to us, whose absence is always with us." Mr Giuliani said: "God bless all of those that we lost, God bless all of you who mourn for them. Remember them and live on in their spirit, and God bless America." A memorial ceremony was also held at the Pentagon, where 184 people died when a third hijacked plane ploughed into the building. Defence Secretary Donald Rumsfeld's voice cracked with emotion as he paid tribute to Pentagon colleagues and servicemen who had been on the front line of US "war on terror" in the five years since the attacks. After laying a wreath there later, Mr Bush struggled to hold back his tears as he met relatives of the dead.